Squirrel and the end of summer picnic, a squirrel story. Mr. Squirrel and the end of the summer. Mr. Squirrel could not help but overhear the car radio playing in the parking lot while the driver prepared to leave the car. It seemed to tell of the possibility of dinosaurs on other planets and the supposition of why it would be dinosaurs there instead of people. Squirrel could not imagine anything so big as a dinosaur supposedly was. Squirrel wondered, "Why did it need to be dinosaurs OR people? Why couldn't it be both on a planet? He thought the radio show also seemed to say it was a fluke or an accident that there were people on earth instead of the dinosaurs that had been on earth. He had never paid much attention to what they said was the reason for that. What was the fluke that happened to the dinosaurs that they had disappeared from the earth? Squirrel wondered how he would be able to exist if there was something as big as a dinosaur on earth. How would it, or they, ever find enough food to eat? Was food much bigger than it was now? Maybe that did not matter. Did the dinosaurs like to eat all the green things around them? Maybe there were a lot less dinosaurs than the regular animals that lived nowadays. "Such a big animal...could it move quickly enough to be able to catch smaller animals as food?" Squirrel wondered. He thought it would have to be a vegetarian or a herbivore because it could not move quickly enough to catch little animals. It certainly could not scamper up and down thin tree branches and twigs the way Squirrel could. Squirrel loved running up and down around the trees and sometimes taking a flying leap into the air to land on something fairly far away. He might have to swing back and forth a bit before he could move on to the next branch. Sometimes he would go out on a branch that would bend low enough for Squirrel to jump onto a rooftop. But then that branch would spring back to its usual spot and Squirrel would have to take a daring leap up back onto that branch just in order to get off the rooftop. He never knew if he would make it back to the branch. He just might miss the branch and tumble to the ground. Squirrel was like an acrobat on a trapeze. He loved to throw himself into the air and feel like he was flying for a moment. He was not like his cousin the flying squirrel. Flying squirrel had extra skin between his arms and legs so that he could really sail thru the air like a kite. He might catch an updraft and even ride it a bit longer than just jumping from one branch to another. Squirrel wondered more about his cousin Flying Squirrel. Where did he like to live? He had lost touch with his cousin. He should find out where he was now. It was a long time since they had seen each other. When was the last time they met? The woodland animals had had a big picnic one year at the end of the summer. The had all gathered from far and wide to be there. Squirrel and Flying Squirrel were quite young then. Squirrel had met a lot of the other cousins too, like Red Squirrel and Black Squirrel. Black Squirrel had velvety black fur and looked just like Squirrel. He lived in a city. Red Squirrel was smaller, his fur a reddish color like a deer or an Irish setter dog. His ears were bigger with long tufts of fur. He lived in the same woods that Squirrel did. They saw each other a lot as they went about their business. Squirrel started thinking how nice it would be to have another picnic like that at the end of this summer. It would be nice to gather with all the other animals, and especially to see the relatives again. They could have such fun having a feast together, playing games, and sharing stories about where they lived. The summer was almost over. There might be just enough time left to make a picnic happen. What would Squirrel have to do? What was the most important thing that a picnic needed? Squirrel would have to get the word out to everyone. He could go to his flying friends, the birds, and ask them to help spread the word. Everyone could bring their own food, the food they liked the best. There was still lots of food around at the end of the summer. Some of it was not yet ready for picking. Apples and nuts were ready. Lots of woodland animals liked that kind of food. Squirrel told his friends the crows and the bluejays about his picnic idea. Where should they have this picnic? In the meadow, close to the edge of the woods, they decided. The crows and the bluejays flew off to spread the news. They would tell their friends in the nearby cities too. They had all decided the picnic would be in one week, the last of the summer. Squirrel went to tell his friend Rabbit and Frog about the picnic. He wanted them to organize the games. Frog agreed to run a game of leapfrog. Rabbit would hold an egg and spoon race, and a gunny sack race. And they had to hold a tug-of-war too! Squirrel went to sleep dreaming about the picnic. In his dream he ran into lots of friends and relatives. Everyone was so happy to see each other. They told each other the news from where they lived. Who had married whom. Who had made families. Who had died. Lots of stories. When Squirrel got up in the morning he was so excited about the picnic plans. He could hardly wait for the day when he would really see every one. The next day he saw Bluejay. Bluejay had had the same dream. As they went about their day they learned that lots of their friends had had this dream. Everyone was talking about the picnic. They could hardly wait for picnic day. Finally it was picnic day. All the animals gathered in the meadow by the edge of the woods. They spread out their foods and set up their games. It was a lovely day, still summer, warm, sunny, and breezy. Everyone was having a lovely day. It was just like in their dreams. Suddenly one of the young bluejays squawked out at something it saw rising from the ground at the edge of the meadow. It was growing and almost flickering and shimmering - as if with orange lights. The animals ran to see what was happening. It was the monarch butterflies starting their long trek to South America. They had decided they could put on an air show for the picnic if they all left at the same time. They swirled up into the sky like a column of chimney smoke curling up. It rose high up before it spread out into cloud shapes and drifted off into its long journey. All those butterflies leaving at once. What a magical sight the animals had seen. Squirrel thought again about those long ago dinosaurs. He was pretty sure they could not gather for such a picnic as he and the other woodland animals were having. Squirrel was very glad to live where he did, with lots of friends, plenty enough food, good times with each other, and a chance to catch up with far away friends and family every once in a while. It had been a delightful way to end the summer. Maybe they would do it again the next year. Squirrel could wait until the next year to think about it. Right now he would just enjoy the good time. How does the "flying" work? Ugh I don't want to do research. What IS a game of leapfrog? Sammy Squirrel had spent his morning doing his usual routine of eating peanuts from the critter feeder or burying peanuts he found there. He had also made plenty of runs up and down and back and forth between the trees in the area he lived in. This area had a road going through it. Lots of cars, trucks, and big huge trucks went on this road. This traffic went by in waves. It was not super fast but neither did it crawl. When the cars whizzed by, it sounded a bit like waves of the ocean. Sammy liked to see what goodies were on the other side of this road. There were big houses along both sides of the road. The houses had big lawns and yards in front of them so they set back from the road. Sometimes Sammy crossed the road by using the telephone wires that went between the telephone poles. He ran across the wire as if he were a tightrope walker. But most of the time Sammy just ran across the road. Sometimes he started across a lawn to head across the road and a huge tractor trailer truck would suddenly zoom past him. Sammy would get bowled over by the blast of air made by the big truck and Sammy would race back to a safe spot under a bush close to the nearest house, until he could catch his breath. He would wait til it sounded quiet and the earth felt still. Then he would run across the road again. Squirrels had to be careful whenever they crossed any wide open areas. Going out into a wide open area where there were no places for small animals to hide, made it easy for hunting birds to see the animal and swoop down while flying to catch it. A squirrel made a good meal for an eagle, especially an eagle that had a nest of two hungry growing babies, eaglets. Eaglets need a lot of food in order to grow big, and to grow to full size in a short time. Eagle parents usually just brought mice for their eaglets. A squirrel would be a big catch for an eagle and could be quite a few meals for the eaglets. The silly cat who loved to chase Sammy sometimes followed Sammy across the road. The cat got plenty of food from different people. He had appeared in Sammy's neighborhood over a year ago towards the end of winter around the time when people tapped maple trees for sap. The sap from the maple trees started to rise up the tree and people gathered some of that sap to make maple syrup. One of the people in the neighborhood had taps in the maple trees and a little shack where he boiled sweet sap down until it became maple syrup. The cat would sometimes crawl into the shack at night for shelter or to take a nap. No one knew where the cat came from. It was a friendly young cat. There were still snow storms at that time of year, and that cat was out and about all hours of the night and day. One could see its big furry paw prints in the fresh snow after a storm. He was friendly to all the people who came and went from the houses and cars in Sammy's neighborhood. The people even started arguing with each other over who wanted to try to get the cat to stay in their house. He had ended up staying mostly with one person. 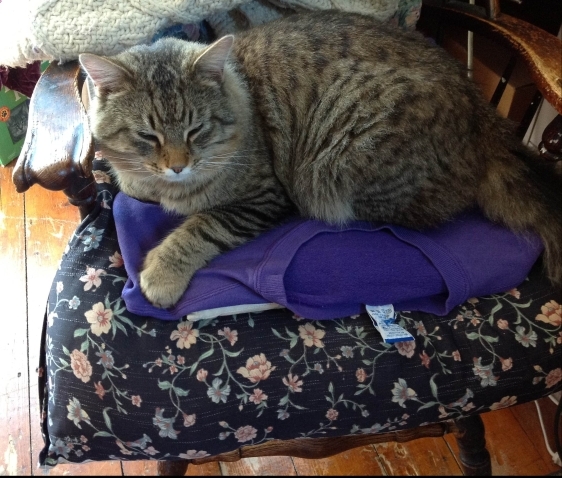 That person never knew where the cat went whenever the cat did not answer calls and whistles to come in for breakfast, dinner, or supper, or the night. and then decided it wanted to go out to see what was going on outside: what it could chase, what or with whom it could hunt or play, with whom it could argue. Or how it could chase away any strange cats that tried to come into this neighborhood that it had decided was its own territory. This cat was not a hungry cat. It was well fed by now. But it loved to chase, tussle, and hunt. Sammy Squirrel always ran away from the cat. That made it much more fun for the cat. Sammy had that big bushy tale that waved behind him. That flicking tail was very intriguing to the cat. Sammy was too big to be a good catch for the cat. But still the cat tried. Sammy had only to run up a tree. The cat would climb up the tree trunk a little ways after Sammy and then jump down before he got too high. He was probably too heavy to keep climbing straight up with just his claws holding onto the trunk. When the cat was a kitten, he was light enough to be able to climb straight up a tree quite far. One time he got stuck high up in a tree and was too afraid to come down. He could not go down head first. Cats usually move in the direction they are facing. If the cat wants to go back where it came from it might not think to go down backwards. If it tries to go down a tree head first it will see how far away the ground is. It might take a long time before the cat either figures out to go down backwards, or to risk everything and go down head first. This cat had learned he should not go too far up the tree after any squirrels or birds. Running across a wide open area after a squirrel was another matter. The cat was bigger than the squirrel so his legs were longer and could cover the ground faster. The squirrel had to have quite a head start to stay clear of the cat. Sometimes the cat would see the squirrel moseying around the lawn across the road with his tail flickering and wiggling behind him. What a temptation that tail was to the cat. The cat too was aware of the traffic that came in waves across the road. He, like Sammy, listened and felt the vibrations in the ground more than he watched for the traffic. Any person seeing Sammy or the cat cross the road, which was considered a busy road, might feel their own heart jump into their throat for fear that the traffic wave would catch up to one of the animals as they crossed the road. The drivers in the cars would sometimes see Sammy or the cat way ahead of them racing across the road. The driver would pray that Sammy and/or the cat made it across the road before their car got there. One could not just stop one's car for these animals with all that traffic behind one. One could not swerve the car to try not to hit the animal. That could cause a traffic accident. If traffic were also coming in the other direction, then a swerve could mean driving into the traffic. A sudden swerve could upset the balance of the car and make it fall over. A big heavy vehicle moving in one direction and suddenly trying to change directions just could not change directions that quickly. Part of it still kept going in the direction it had been going in. Objects in motion had to change directions gradually. No one knew whether these animals were lucky, or really knew how to safely cross that busy road. It certainly looked scary to the people who gave food to the cat and set out peanuts for the squirrel in the critter feeder. But day after day those animals made it back and forth across the road safely, sometimes apparently just barely so. Every once in a while there were animals that were not so lucky. They were the slower ones, or those that did not get a lot of practice in how to do it. It just took one time of getting almost hit by a vehicle, for an animal like Sammy Squirrel or the cat to learn they needed to watch out for traffic. They learned their lessons quickly. Sammy Squirrel was up in the tree shelling and nibbling the peanut he had just retrieved from the critter feeder. He had to put a bit of effort to lift the wooden lid of the feeder and reach inside for a peanut, but it was quite doable for him. Sometimes he stayed right there and ate his peanut. Other times he might go bury it somewhere. This time one of the neighborhood cats was hanging around looking at Sammy. Sammy took his peanut up the nearest tree. One of his favorite trees, a large maple tree, was no more. It had been taken down before a big storm several weeks earlier. The people had taken it down. This was a big surprise to Sammy because his nest had been high up in that tree. It was a nest of dried leaves. This was where he slept and hunkered down. The mass of dried leaves kept him insulated against the bitter cold winds that blew all winter. The dried leaves, his thick grey fur and his bushy tail kept his body heat snuggly around him so that he was warm. He slept a lot in the winter so that he would not need so much food - food that was not growing in winter. But it was spring now. The tree buds were starting to come up. Life was starting to brim again. And Sammy just wanted to be able to tell some stories to his family..He still had to find Mrs. Sammy Squirrel. Sammy was young himself, so this spring he had to find and meet a squirrel who would be Mrs. Sammy Squirrel. But here was Sammy wanting to make stories to tell his children. He gnawed his peanut hardly tasting it as he wondered how to make up a story. Every parent had stories to tell their children he was sure. That was what parents did. Children loved to hear stories. Sammy had loved hearing stories from his parents. What were the stories his parents told him? That seemed so long ago that Sammy could hardly remember, especially after sleeping so much during the long winter they had just had. Could he tell them about some of his dreams? He could if he could remember them. The dreams too seemed so long ago now that winter was over and the spring was pushing through. He had no idea how he would be able to tell stories to his children. He would have to start all over again with stories. He might not even have time to learn how to do it. What ever he told them would have to be good enough. Sammy worried his peanut shell and then threw it to the ground off his branch. Sammy Squirrel would go around and ask the others in the neighborhood how they made up stories for their children. Sammy Squirrel went to ask Cory Crow how he told stories to his children. Cory told him that he did remember all the stories his parents and his grandparents had told him. Bluejay said he remembered about three or four stories from his parents and just told them over and over again. The cat hanging around in the yard said he could remember his dreams and told those to his children. Mostly they were about chasing Sammy Squirrel around the ground and partly up a tree, or waiting patiently for a mouse to come out of a mouse hole. The mockingbird said he had lots and lots of stories for his kids. He liked to sing them all in one song, one right after another. "When you hear me singing my medley, I'm telling them about all the sounds I hear." said the mockingbird. Chippy Chipmunk said he would tell his kids about the day he got stuck first in the truck, and then in that store, and got so scared. He would keep telling them that story so that his children would be careful not to get lost like that. It had been just so lucky that he had been able to get back home after that adventure. Sammy asked Fergy Fox about telling stories to his kits. "Sure I tell them stories. They just pop in my mind all the time. I know so many tricks and ways to go. It is just as easy for me to tell a story as it is for me to figure out how to sneak up on an animal that I'm hunting, or to quietly steal eggs from a chicken coop and disappear before anyone knows I did it. You know lots of ways to go through the tree branches. It is the same thing. The more tree branches there are the more ways there are for you to twist and turn and hide or run when you are escaping... Say, what are you going to do now that that big old maple tree is gone? That used to be a good bridge for you from one set of trees to that apple tree over there. Will you have to run across open ground all the time just to get between the apple tree and the critter feeder?" Fergy Fox could not help but want to know how Sammy Squirrel would act when he had to run from him again. They were friends right then, but there were times when Fergy got very hungry and just had to try to catch Sammy for supper. Fergy had had a big breakfast that day, and did not care about trying to catch Sammy. Sammy could always feel when he was safe around Fergy. And Fergy did not come down to the critter feeder too much. Fergy mostly came out at night and preferred the woods and the wilder neighborhoods. An idea came to Sammy Squirrel for how he would make up a story to tell his children. Yes, he could tell them anything he remembered about things that had happened to him. Or the stories he might remember from his parents. Or whatever he remembered from his dreams. This idea however seemed like it could be fun for him to try. He would go out and find five things he could bring home to the nest. Or he could just look around him and think of five things he saw around him. There was the old car with all that stuff in it. There was an old table sitting under the trees. There was a cat statue sitting in the flower bed. There was a ragged old windsock hanging from a pole. And there was a bucket full of water that used to be snow. Sammy wondered what would happen if he pretended these things talked to each other. What would they say? They must have seen a lot of things when he was not watching. Sammy would tell his children whatever he could think of that these five things might talk about. Each night Sammy would ask his children which of these five things did they most want to hear about that night? Sammy thought he was pretty sure he would be able to take it from there and be able to tell stories that he thought the five things might have seen in a day, or in any day long ago. Yes, this sounded like a good idea for Sammy Squirrel to try. Now he just had to go find Mrs. Sammy Squirrel. Where could he find her? 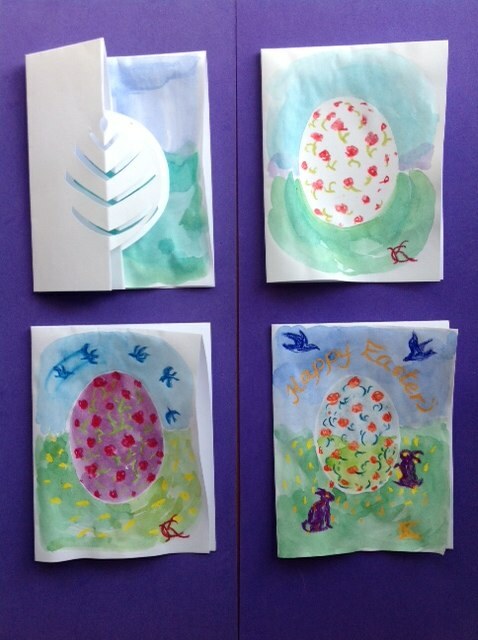 Sammy Squirrel's Easter story, and some Easter Egg cards. It was Easter morning. Sammy Squirrel had promised his friend Rudy Rabbit he would help him with his Easter delivery rounds. He had really wanted to do this when he promised. But now that the morning was upon him, he just wanted to sit there and muse upon things. To sit and look at the world just around him. To ponder the way of it. To be idle. He loved being idle and being able to daydream. He also loved to rush around and do things. It felt good to get excited and make things happen. The things Sammy Squirrel liked to do, or usually found himself doing, was to find food and either eat it then or find another place to hide it. Usually he would scurry off from where he found the food, dig up a little hole in the ground, put the food in the hole, and cover it over. He kept very busy at this task for most of his day. One could think it was work. Sammy liked doing this. He could not help but do it. He had to do it. It felt so good to him to do this, it was so easy for him to do. Was it really work? 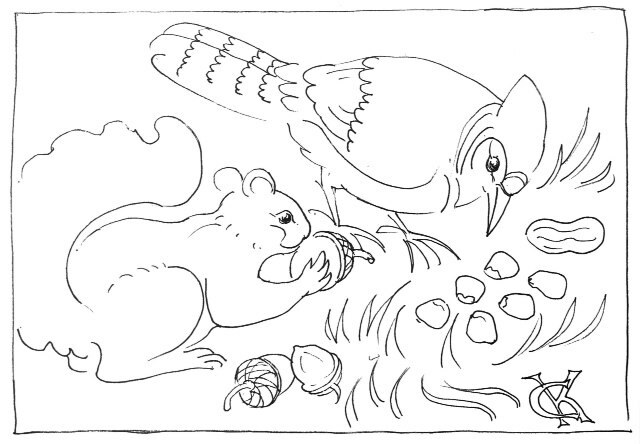 Often times other animals, like bluejays and crows, followed Sammy Squirrel around as he buried his treasures. They knew what he was doing. As soon as Sammy was done covering one food cache, they would go uncover it and take out the food for themselves. Bluejay might go hide it somewhere else himself. He did not usually bury it in the ground. He just put it in a pile of leaves or old grass and covered it back up. An acorn or nut could get moved around a few times. Perhaps a crow or a seagull would see what the bluejay had done with that nut. Crows and seagulls do not have the patience to bury something themselves. They are bigger and need to eat all the food they can find when they find it. Seagulls are not fussy what they eat..
Seagulls are so gluttonous they will swallow things that are too big for their throats, just so they can eat it before another animal, even another seagull, can get it. And then the seagull squawks around with the lump of food in his throat, while another seagull follows it hollering at it to try to take that food hiding in the other seagull's throat. They squabble and tussle over a bit of food. Anyone watching might worry that the seagull with the food in his throat will get stuck like that. This also happens along the piers and harbors, where the people set out their fishing lines. A seagull might grab hold of a fish as it is being pulled in on a line, and swallow that fish that is on the end of a line. Now the seagull is on the line too. What happens? How often does this happen? Here was Sammy Squirrel thinking he did not want to go help Rudy Rabbit. He wanted to daydream about all the acorns and nuts he would find that day and go bury in the lawn that had just started turning green after the long cold winter. He'd seen where the crocuses were coming through and blooming. That had already started over a week earlier. There had been yet another snowstorm just a few days before, but that did not matter. Sammy knew it would not be long before it got warm and stayed warm. Before there were lots of plants around. Before there was lots of shade because the trees were full of green leaves. Everything would be green. There would be lots of bugs around. The sun would shine a long time on most of the days. In the winter the sun seemed to shine for such a little while every day that it was out. It always felt as if it had hardly come up for the day before it had to disappear again for the night. That was why it got so cold during that time. It got so cold that there was not much food around. The best someone like Sammy could do was to sleep as long as he could. He would curl up in his leaf nest high up in the tree branches and go to sleep. During this cold weather there was also no good place to hide food if he found it. The ground was too cold. It was so cold it was frozen. On some winter days it warmed up a bit and the ground thawed a bit. Those were the days that Sammy's friend, Rory Raccoon, who slept most of the winter time, woke up and came out to look for a snack. The day had flown by as Sammy Squirrel sat there pondering and munching on the acorns from the pile he had dug up. He had not gone to help his buddy Rudy Rabbit with his Easter job. He had seen children running about with Easter baskets on their arms, screeching with glee every time they spied an Easter hunt trophy. Some where cleverly hidden waiting for the older children to find. Some were practically out in the open for the youngest children to find. When they had found all there was to find, they went in their houses to eat their goodies and play with any toys they might also have found. Sammy knew they might also be having a big feast for Easter. Not all families did that though. Lots of kids were fussy about their food and did not even like the foods served at Easter dinner. One child he knew only liked ham and Easter cookies at Easter. Perhaps the fussy eaters were served hamburgers and hotdogs. Sammy sniffed around at some of the candy wrappers that blew through the grass in the spring breeze. He did not care for chocolate. He could smell some peanut odors in the wrappers but there were no peanuts with these wrappers. Cory Crow flew down and picked up the shiny candy wrappers. Cory Crow liked shiny things. He collected the wrappers and took them off to his special treasure cache. He even put some wrappers in his nest. They would make his nest sparkle. Rudy Rabbit went home to his burrow quite tired from all the work he had done that day, delivering Easter baskets and hiding Easter eggs and treasures around his neighborhood. He felt good that things had gone smoothly, even though Sammy had not come out to help him. Ginger and Jolie Rabbit had helped. Rollie and Renee Rabbit had also. 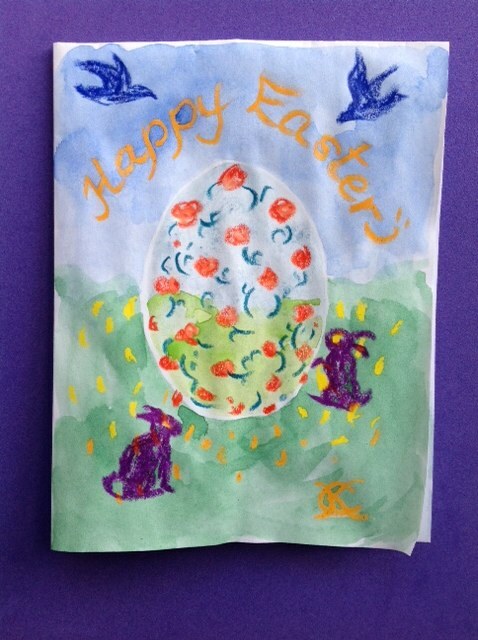 Other rabbits saw to the Easter deliveries in their own neighborhoods. It had been a satisfying day for them. They did not have to think about it again til the next year. Now they could go back to their daily business. Caran d'Ache crayon resist and watercolor on copy paper 'frenchfold' card. Cory Crow was flying aimlessly about trying to decide where he wanted to go that day, what he should do. At the moment he felt he should be either gathering peanuts from the feeding area and hiding them in caches, looking for crabs on the seashore, or gathering sticks for a nest it would soon be time to build. It was sunny this day. Cory could see his shadow flying along across the snowy field below him. He stopped on a tree branch of the maple tree. It had snowed that night. The branches were all topped with snow. Cory drew his beak across the snow crisscrossing the branch with it as if it were a knife being sharpened. This beak and head gesture was a bit of head weaving that said to any nearby crows that he wanted to be friends, that he wanted to share in their food. As he did his beak rubbing he scooped up some of the snow and ate it. He hopped along the branch scooping up more snow, as if his beak was a shovel, He got a load of snow in his beak and swallowed it down. Snow was what the crows and most of the animals had instead of water during much of the wintertime. Where should he go? As he flew about wondering what to do he saw cars gathering near the water's edge in one part of town. People where gathering there dressed in all their winter gear - snowsuits, heavy boots, mittens, scarves, colorful puffy hats. There were lots of kids. Some were dragging sleds, and sliding saucers. Some carried skates. Some carried skies. And some carried long sticks with a bend on the end. It was the annual winter carnival the town was holding. The carnival had an ice carving competition. It had a snow fort building contest. A snowman contest. A sledding, sliding, and snowboarding hill for the kids. Places to do cross country skiing and snowshoeing. And an iceskating pond where the hockey players skated around so fast as they hit a puck on the ice with their hockey sticks trying to get it through the goal while keeping it away from the other team. All of this event depended on there being plenty of snow on the ground. This day was perfect for a winter carnival. Cory landed on a nearby maple tree to watch the hockey skaters whizzing about. The icecarving competition sparkled in the sun as the carvers worked at making ice sculptures from blocks of clear ice. Cory, as do most crows, loved sparkly things. They fascinated him. The sunlight danced off the shiny clear ice in many shimmering rainbow colors. Cory went over to see if there was any way to pick up one of the lights. There were too many people around for him to feel comfortable going any closer than the tree branch he found. How he wished he could grab one of those lights and take it home with him. Then he would be able to watch it sparkle up close. He could watch from his branch though. As Cory watched the carving he began to see animals taking shape from under the carvers' hands and tools. One was making a rabbit. One made a sleeping cat. There was a barking dog and an eagle with outstretched wings. And then Cory saw it - the Ice Crow. It was at least four times as big as Cory but he knew it was a crow. And it was clear - a crow one could see through. Was this a magic crow? Was it going to fly into the air? Did this crow need to eat? If so, how much food did it need? Was the crow inside that ice block the whole time? This crow had not come out of an egg. It had slowly appeared from the ice block as the carver hacked and chiseled away ice. Cory had to find his friends to tell them what he was seeing. Perhaps he could tell them from where he watched on his branch. He started to holler as loud as he could in hopes the others would hear him. He also wanted to talk to the Ice Crow, but he was confused. Ice Crow was so big, transparent, shiny and sparkly. How did one talk to such a crow? Could that crow talk or hear? A few of Cory's friends heard him faintly. Cory and the carnival were quite far from where they all usually liked to be. Some crows who lived near the carnival heard him too and came flying over to see what the commotion was. Cory's friends followed his faint but urgent sounds and came shortly. They were dumbfounded at the sight of the Ice Crow once they saw what Cory was hollering about. After a moment they all started hollering. They also saw the Ice Eagle with its wings spread out. The eagle never went in the air. They saw the dog barking. At first they thought they could hear it barking but that was only their imagination playing tricks on them. There was no sound coming out of the barking dog. The cat kept sleeping. Nothing odd about that except that their hollering did not cause the cat to twitch an ear or peek up at them. The rabbit too stood still. It was not afraid of the sleeping cat, the barking dog, or the eagle. All of these were animals that would normally like chasing and maybe having rabbit for supper if they caught it. The Ice Crow stood still and did not answer their calls. 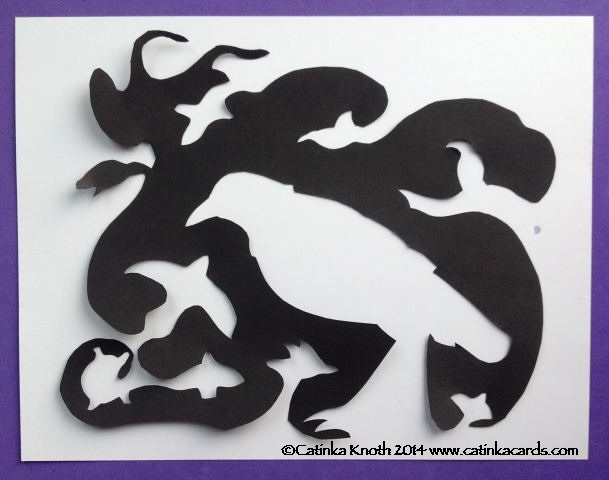 Ice Crow papercut by Catinka Knoth (negative from previous cut). They were entranced by how sparkly and glittery it was, so they did not give up in trying to get it to answer them. They were also secretly hoping this Ice Crow so big, shiny, glittering, and magical looking, might be their leader and tell them what to do whenever they got confused about things. They often wished they had someone to decide things for them, to tell them what to do, to tell them the right things to do so that they could usually be right in whatever they did. It was still winter though and the sun was starting to set - early as it always did in winter. The crows had gotten no response from the Ice Crow. They flew home to their usual fir trees for the night. They would come the next day to see if they could change the Ice Crow's mind. The next day was Sunday. The sun rose making the sky pink. It melted some of the snow on the branches so that they formed ice droplets twinkling in all the trees. The crows, after they had eaten from the food that the lady in the truck so often brought for them, flew over to see the Ice Crow again, and to ask it again for help. They started their hollering at the Ice Crow. This time they did not holler as much but did some of their gurgling clucking sounds, just the way they talk to each other when they are being friendly with each other or asking to share in the food. First Cory pricked up his head because he thought he'd heard an answer from the Ice Crow. He cocked his head to listen better. He noticed that the Ice Crow's beak was not so pointy anymore and the eye could not be seen as clearly. The feathers were disappearing and the body was looking wet. Cory thought he'd heard the Ice Crow saying "Be your own leader". Another crow stopped with his mouth open because he too thought he had heard the Ice Crow talk. "Follow your nose!" is what he thought he had heard. One by one the crows fell silent as they each thought they were hearing the Ice Crow answer them. "Be as a crow!" one heard. "Live! ", "Fly! ", "Eat! ", "Play! ", "Holler! ", "Make a nest!" . They each heard something different but not really that different. The Ice Crow was silent. Its beak was shorter and stubbier. the eyes closing, Where there had been feathers was now quite smooth. The sun was setting again. The crows flew home to their roosts. They talked a bit about the things they thought they'd heard the Ice Crow say. They could not agree on what they'd heard. They wondered what they had heard. That night the wind blew in from the South. It was a warm wind. By morning it was very warm out. The skies were grey. It looked like rain. And then it did rain. It rained almost all day. The crows stayed hunkered together in their roost in the fir trees. By late afternoon the rain stopped though the sun did not come out. It was still very warm out. Most of the snow was washed away. 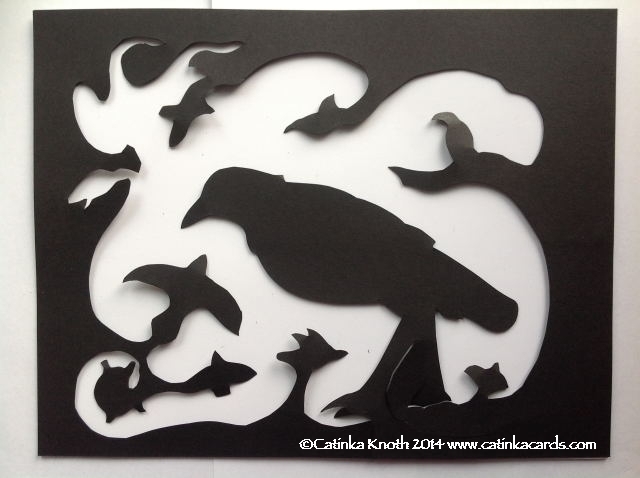 The crows could not wait to visit the Ice Crow again to find out what it had said to them. They flew over to the winter carnival site. It was not much to look at without the snow around. The ice sculptures had melted down a lot in all that rain and warm air. There was not much left of them. The crows looked at what used to be the Ice Crow and was now just a lump of ice, like a little tree stump or ice log standing up. They could not believe what had happened to their glorious Ice Crow. They gave a few hollers at it. They hopped over to have a closer look. There were no people around now to scare them off. It was not even sparkling now. Had the Ice Crow spoken to them? They had been so busy hollering and talking at it that they could not be sure what they had heard. They wondered at the mystery of it and talked with each other about it. They spoke and listened to each other. They wondered if it was perhaps themselves they had heard. They remembered they had been happy as crows without a leader before, so they could be happy now without a leader. The Ice Crow had been beautiful, but had soon melted away.